Bread + Roses Cafe space on North Parade in Bradford regularly inspires discussion and the sharing of ideas. T’other day I had the pleasure on sitting in on the second Food Business Meet-up, hosted by Bread + Roses’ veggie chef extraordinaire Sonia Sandhu and the brains behind the scenes, social media and marketing whiz, Jack Lynch. The group in attendance featured Manjit and Michael of Manjit’s Kitchen (see here for more), and Gunter representing the second generation of Oastler Market’s own Roswithas, a family-run delicatessen offering a wide range of international produce including meat and cheese. In addition, Fiona of Stir & Sip and Lisa of Edward St. Bakery also joined the assembly – two very reputable Saltaire establishments that, who like the others, started from zip, zilch, nothing. 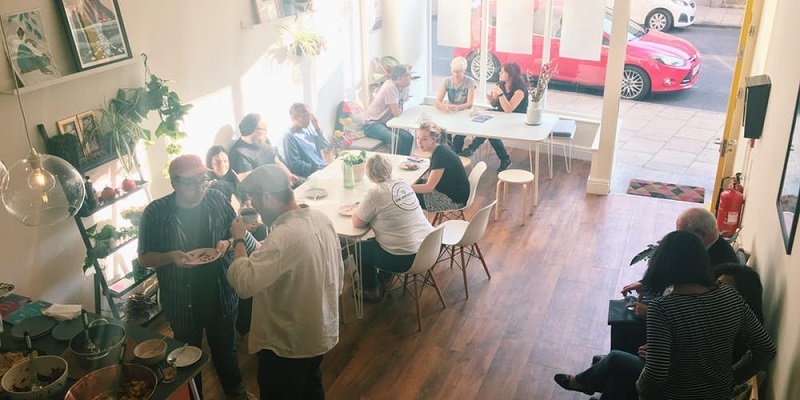 Alongside these foodie mavericks sat Chemaine, a formidable force behind wur Bradford – a non-profit organisation that endeavours to get people into places less trodden, and create communities from within, encouraging and facilitating individual creativity. Shoulder to shoulder at the big trestle table over delicious chana wraps and coffees, these visionaries created a discussion so electric and inspiring you could practically hear the hair raising. The topic of the hour was markets, and the fascinating contrast between the challenges that plague not just Oastler and Leeds Markets but also nationwide, and the magical contributions that they have to offer to the communities they serve. Michael kicked things off with the observation that despite the international prestige that Leeds had accumulated, it hadn’t had an effect on Leeds Market where Manjit’s Kitchen is based, who seem to be caught in a nostalgia trap where its proprietors are keen to preserve its industrial heritage and therefore a touch reluctant to embrace innovation. The result of this at Leeds Market is the stark contrast between the traditional indoor market stalls with the same butchers, clothes shops and that age-old Marks and Spencer’s, and the food court area where patrons are greeted with a giant kaleidoscopic owl and dozens of street-food outlets offering interesting and high-quality burgers, hot-dogs, curries, Yorkshire-pudding wraps, jerk chicken, pastries and more – all of which sold at a fair price. Likewise, at Oastler market the same familiar businesses that I can remember from childhood offering everything from a full English breakfast to a leopard-print bodysuit in addition to the usual fresh fruit and veg, meat and fish places. Although Oastler hasn’t received the same level of financial investment, it is occasionally brought vivaciously to life with thank to wur and company’s market-based events including tours and talks, offering insight into the hidden histories of the market and what it offers the city, past and present. The group nodded and grinned in consensus as general public opinion of markets was shared, perceived as being stale and a bit crap, which may be a fair comment when considering what they’re up against – the faceless and polished behemoths of food, drink and lifestyle brought to fruition by forgetting where they came from and through extensive research, enabling cost-effectiveness and capitalising on the weakness of human beings’ tendency to behave compulsively. What these industries cannot offer however, that these markets most definitely can, is contact. A supermarket with a self-service machine can’t offer you an education into the origin of your basket’s contents, or ask how the kids are. They can’t offer the deeply personal journeys that independent food business owners have endured and toiled through out of pure determination and passion. That’s not to say that chains and corporations do not have their place in our society by being that quick, cheap and easy resource that people need for their convenience and familiarity. There’s no reason why these two entities cannot live side by side, functioning as the yin and yang needed to provide the full wellbeing package. If supermarkets and high-street stores are the yin for their convenience then what is a market’s yang, you might wonder. Based on the vibrant collective thinking of the group’s ideas, markets are the incubative creative hotbed our 21st century towns and cities desperately need, reclaiming control of our local identities with community and art at its heart, and therefore a much-needed antidote to a growing loneliness epidemic. Markets grant the entrepreneurial access to those with dreams to offer something new and different without being confronted with the cold hard wall of stifling business rates and rent for one, and for patrons it returns food to the heart of the equation by being the reason for bringing people together in an ambient and colourful atmosphere. It is vital for market owners everywhere to consider the potential their spaces have to offer, once they have been adapted to our modern, fast-paced culture. Some may call this gentrification or ‘art-washing’, using the buzzwords and trends of today to draw in the crowds, but in reality, this is just what is needed in order for markets to not get left behind. By combining the immemorial personality and authenticity of marketplaces borne out of the delectable soup of local and immigrant offerings, with the contemporary incentives of wellbeing, local and environmental consciousness, and anti-consumerism, a whole new and highly attractive concept is created. In a sense, there was no better place in which to have this exciting marketplace trading conversation than in Bradford as born-and-bred Jack explained – without the consistent grassroots innovation and accessible social enterprise, it would struggle to survive. Bradford has true grit, and the supportive, community-oriented vibes that I have been fortunate to grow up around provide an ideal foundation on which new ideas have real opportunity to propagate and thrive. 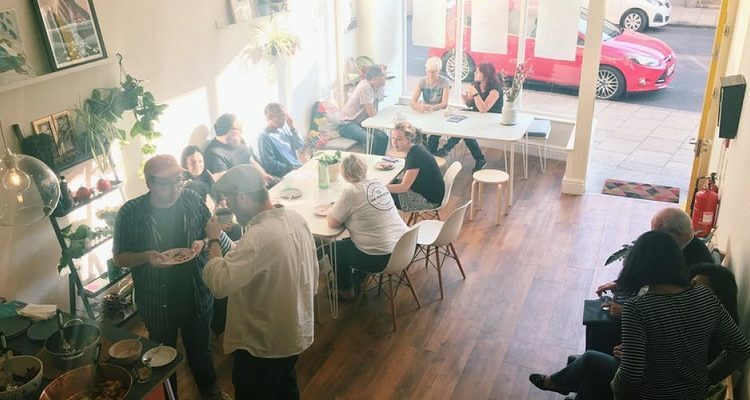 Moreover, hosting food business meet-ups at Bread + Roses, which is a true testament to these attitudes, acts as the perfect hub to further inspire and develop alongside pioneering peers and proteges. I thoroughly enjoyed being immersed in the rich, positive atmosphere that each member of the group contributed to and can only hope this marks the beginning of a solid cultural tradition Bradford and Leeds can share together. Previous Post:THEATRE | Northern Broadsides’ They Don’t Pay? We Won’t Pay!